The government should cut its ties with the "expansionist" European Court of Human Rights, says a report by a right-leaning think tank. The Policy Exchange report says the recent row over prisoners' voting rights highlights the issue. The report, written by a former government adviser, Dr Michael Pinto-Duschinsky, says the UK has become "subservient" to the Strasbourg court. He says it also ignores the traditional British freedom of the press. The report claims the 47 Strasbourg judges have "virtually no democratic legitimacy" and are poorly qualified compared to Britain's own senior judges. Lord Hoffman, a former Law Lord, who wrote the foreword to the report, said Strasbourg has "taken upon itself an extraordinary power to micromanage the legal systems of the member states". The report says the ECHR is a "virtually unaccountable supra-national bureaucracy". The row over voting rights for prisoners was sparked by a judgment from the ECHR in 2005. The court upheld an appeal by convicted killer John Hirst, who said Britain had breached the European Convention on Human Rights by disenfranchising him. The judgement meant the UK government was forced to allow prisoners to vote but has tried to limit it to those who were sentenced to less than four years in jail. Blair Gibbs, Head of Crime and Justice at Policy Exchange, said: "Votes for prisoners has brought to public attention the growing conflict between judges and the wishes of our own elected parliament. "On this issue, judges in Strasbourg have strayed well beyond their remit and have casually trampled on the rights of Parliament and the role of MPs to decide these essentially political questions. "The public favour such cases being decided in the UK, not by foreign judges sitting in a remote court." Would the sky collapse without Strasbourg - would Britain become a pariah state? Policy Exchange says not. The main difference is that British citizens would no longer be able to appeal to the Court and the government would not be bound by its decisions. The European Convention on Human Rights would still be incorporated into UK law, as it is now, and be reflected in decisions of the domestic courts. But the final arbiter for cases relating to human rights would be the UK Supreme Court. 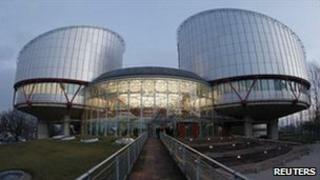 The Court would frequently take account of Strasbourg decisions - but it would not be obliged to follow them. The think-tank says Britain would not face expulsion from the Council of Europe or the European Union, as some experts have suggested - though any move to sever ties with the Strasbourg court would not be straightforward, involving some tricky legal manoeuvring and political negotiation. Policy Exchange says the court represents "worthy ideals" but is not "fit for purpose" and requires "substantial reform". If improvements are not made within two years, says the report, the government should consider withdrawing from its jurisdiction in order to prevent UK citizens lodging appeals in Strasbourg. Neil O'Brien, director of Policy Exchange, told the BBC that the UK government did have to follow what was decided in Strasbourg, but that it should end this arrangement. "Although it is not an easy or simple thing to cut our ties with the court, it is possible, and we argue that for a whole series of reasons we should now cut our ties with the court because it is, increasingly by trivialising and over-extending the concept of human rights into areas where it really doesn't belong... it's really undermining support for human rights," he told Radio 4's Today programme. BBC home affairs correspondent Danny Shaw says the prevailing legal wisdom has been that severing ties with Strasbourg would jeopardise Britain's commitment to human rights laws and its membership of the Council of Europe and the EU. But the report says there is "strong evidence" from legal experts that this would not be the case. Lord Hoffman writes: "In the last few years, human rights have become, like health and safety, a byword for foolish decisions by courts and administrators. "The tendency has been to say that there is nothing to be done. We are stuck with the Convention and the European Court of Human Rights and unless we are willing to cast ourselves as a pariah state and get expelled from the European Union, we must accept the court's jurisdiction. "But Mr Pinto-Duschinsky shows that the situation is not so hopeless and there are means by which, with sufficient support from other states in the Council of Europe, we can repatriate our law of human rights. It is worth a try," he adds. But former Labour foreign minister Denis MacShane said the claim Britain pull out of the ECHR without political consequences was "dangerous nonsense" and "would shame Britain around the world". He said: "Of course the ECHR annoys people who think that every British judge and jury are perfect and never make mistakes. But justice and respect for law are stronger if citizens feels there is an appeal process. "Compared to other major world regions - the Americas, Africa, or Asia - the citizens of Europe have in general terms a broader sense of living under rule of law with their human rights upheld. "When the ECHR was written capital punishment was the norm and homosexuality was a crime. Today we think differently and what the ECHR does is to reflect changes in social and penal thinking and spread new principles and practice more widely." Writing in the Sun, Lord Carlile, the government's reviewer of anti-terror laws, said that the European Convention on Human Rights was created in 1948, but that it now "no longer functions properly" and needs updating. He added: "A new convention could mean new and more rights - consumer rights, environmental rights, internet rights. "More cases would be decided in this country. A new convention would allow greater differences of interpretation according to local attitudes leading to a more realistic view of who can stay here."